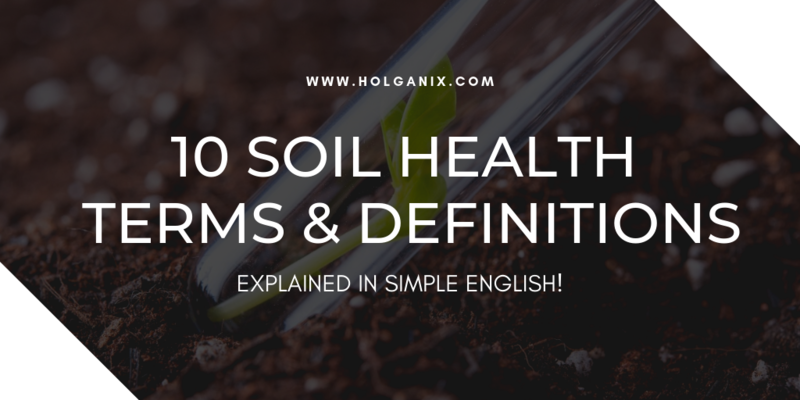 10 Soil Health Terms Explained In Simple English! Soil health has become an important benchmark for all growers - regardless of whether you are growing corn, berries, turfgrass or ornamental trees and shrubs. Yet for many, soil health definitions and terms are new and confusing! In this blog, we focus on providing simple and concise explanations for 10 key soil health terms. To “short-cut” the article, you can select any term you would like to explore using the list below. Soil structure influences water and air movement, soil microbe activity, root growth, and seedling emergence. In short, it is the arrangement of pore spaces and solid soil particles that are glued together by sticky substances created by bacteria and root hairs. Good soil structure has 50% soil particles and 50% pore spaces occupied by air and water. The Intergovernmental Science-Policy found that 75% of our lands are degraded. Their assessment took three years and included more than 100 experts from 45 countries. Check out the image above from GRID Arendal (A center collaborating with the United Nations Environment Program) which demonstrates degraded land worldwide. 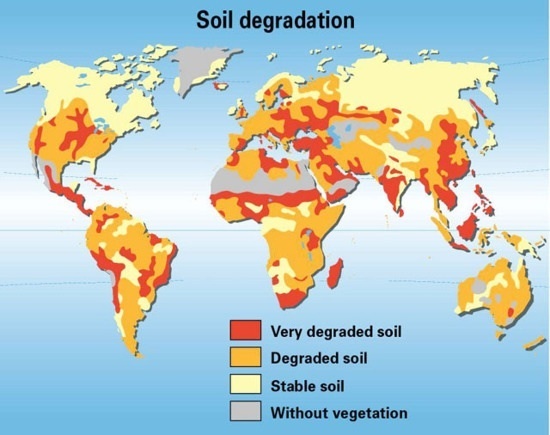 Soil degradation can be caused by improper land use through agriculture, pasture urban or industrial purposes. Within the natural world there exists a complex balance among living organisms known as the “food web.” Plants, animals, and microorganisms are all instruments in an orchestra; each plays a crucial part in the natural symphony of life. If even one of the players is out of tune, the whole soil food web suffers. However, when everything is in order, the results are beautiful. 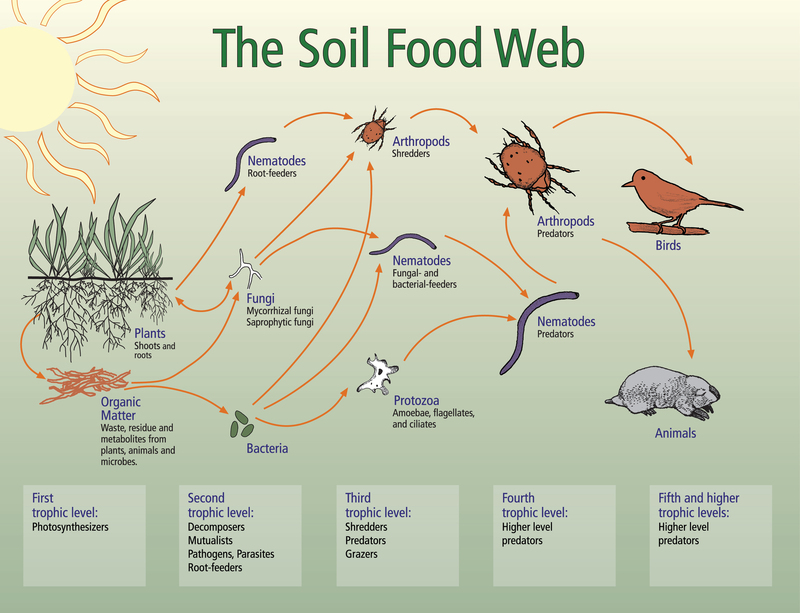 A healthy soil food web is very similar to the food web we all learned in middle school (see image below from the National Resources Conservation Services). One of the functions of a healthy soil food web is to hold nutrients in non-leachable forms so they remain in the soil until the plant requires them. The plant triggers the right soil microbes to convert nutrients into forms the plant can uptake (but which are typically very leachable), in exchange the plant provides sugars for the microbes. When the correct ratio of fungi and bacteria to protozoa (prey to predator) is present, the soil pH, structure and nutrient cycling occur at optimum rates, producing the right form of nutrients for the plant when the plant needs them. Soil microbes recharge soils, that ultimately leads to improved yield, root growth, and crop resilience against stress. Increasing beneficial microbe populations and diversity in the soil is an important component to improving soil health. In fact, it is impossible to build topsoil, soil structure and convert plant and animal debris into nutrients without microbes. There are 5 types of soil microbes: bacteria, actinomycetes, fungi, protozoa, and nematodes. Each type conducts a unique job to improve soil and plant health. 1. Applying a microbial product like Holganix Bio 800+ - Holganix Bio 800+ harnesses the power of over 800 species of beneficial soil microbes that improve: (1) soil health, (2) plant resilience against stress like disease and traffic, (3) crop yields, (4) root depth and density, and (5) turf professionals can reduce their use of fertilizers and pesticides. 2. Supporting microbes already present in the soil with microbe food - Applying sugars, using compost, reducing your tillage and incorporating cover crops are all ways to feed the microbes already present in your soil, or those you apply to your soil through microbial products. However, deep freezes, flooding, tillage, and some chemicals can harm the soil’s microbiome, so it’s not just important to support the microbes already present in the soil but to also supply a diverse concentration of microbial species. The Food and Agriculture Organization (FAO), states, “bacteria may well be the most valuable of life forms in the soil.” Beneficial soil microbes are the crucial workforce of soils and are charged with breaking down nutrients and releasing them to the root zone for the plant. Some species like Plant Growth Promoting Rhizobacteria, release plant hormones that encourage plant growth. Like bacteria, fungi also live in the root zone and helps make nutrients available to plants. For example, Mycorrhizae fungi facilitate water and nutrient uptake by the roots and plants to provide sugars, amino acids, and other nutrients. Other beneficial soil fungi like Trichoderma help the plant fight disease and improve root growth. Think of the soil as the pantry for plants, storing the necessary nutrients to feed the plant and ultimately boost plant health. The Cation Exchange Capacity (CEC) is the soil’s ability to maintain and release nutrients to the plant. So, the higher the CEC, the larger the pantry and the more “food” the soil has the ability to store and feed to the plant. How can you increase CEC? Check out this blog on how superintendents like Shannon Easter at Broken Sound Golf Club and Matt Boyd at Orchid Island Golf and Country Club, are using Holganix Bio 800+ Golf to drive CEC. Soil organic matter (SOM) is made from carbon and once-living plants that are broken down by soil organisms like bacteria, fungi, and earthworms. Soil organisms utilize SOM as food, and when digested, exude nutrients and humus. Once SOM has been efficiently broken down, SOM becomes humus. Increased SOM in soil promotes improved soil structure, biological activity and an increased ability to hold and release nutrients and water in the soil. Good, healthy soil contains 3 -to-5% SOM. Low SOM is a sign of soil degradation. So, how can you increase SOM? Combining Holganix Bio 800+ to provide a diverse set of microbes, with practices the feed soil microbes (think no-to-low till, cover crops, compost, etc), will allow you to slowly build SOM. Check out this blog on how superintendents like Shannon Easter at Broken Sound Golf Club and Matt Boyd at Orchid Island Golf and Country Club, are using Holganix Bio 800+ Golf to improve SOM. After the litter decomposes, the thick brown or black substance that remains is called humus. Regenerative agriculture describes farming and grazing practices that focus on regenerating topsoil, allowing farmers to maintain crop yields, improve water retention and nutrient uptake, increase farm profitability, and support biosequestration, among other benefits. The backbone of regenerative agriculture is a focus on strengthening the health and vitality of farm soil. The key is that regenerative agriculture “Does no harm” to the land, and in fact improves it using technologies to build soil health like compost, recycling waste, limited-to-no-tillage, among other practices. We know regenerative agriculture and long-term sustainability of farmland hinges on the health of soils. But, how do soils work? And, what does healthy soil look like? 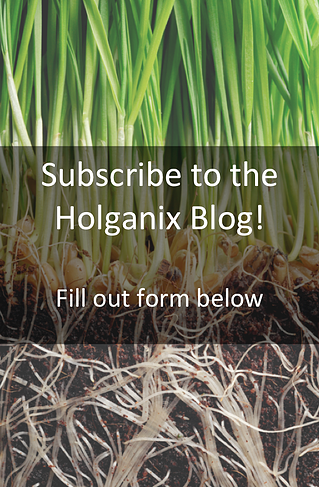 Dig deeper into soil science with by downloading our FREE eBook by Holganix Director of Soil and Plant Science, Dr. Robert Neidermyer.